Parents of small children lean in now. Purists please look away. This cousotto is the perfect recipe when you get in late and need to get food into mouths fast without resorting to packets. I’ve made various versions of this since my boys were teeny. They and I still love it. 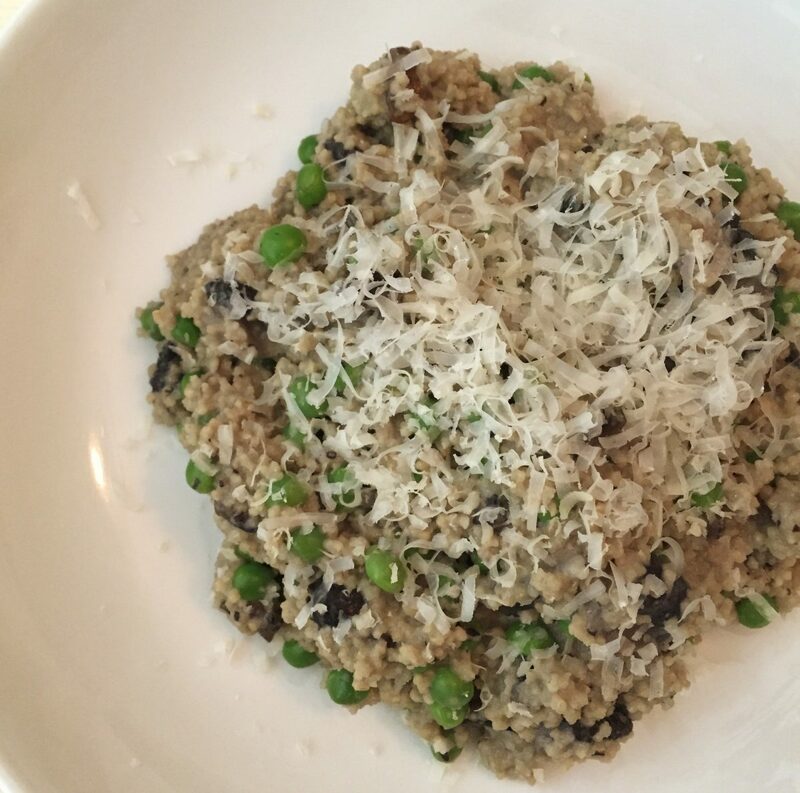 We call it ‘cous-otto’ because it uses couscous in place of rice with a lazy risotto method. This mushroom and pea combo is a regular here but I basically use whatever veg they’re into that I have in the fridge. You could use passata in place of half the water if you want to make a tomato flavoured version. You could stir some tuna or shredded cooked chicken if you want to up the protein. A bit of pesto is lovely stirred through too if you have some. 1. Roughly chop or slice a couple of handfuls of chestnut/crimini mushrooms. 2. Melt a knob (about a teaspoon) of butter in a medium sized saucepan on a medium high heat. 3. Add the mushrooms to the melted butter and stir with a silicone spatula then cook for around 5 minutes until they slump down and release some of their liquid. Stir every couple of minutes but don’t be a slave to the pot. Instead use the time to prep the other ingredients. 4. Peel and slice a clove of garlic and add it to the mushrooms with a pinch of sea salt and some black pepper. Cook for a minute before adding a handful of still frozen peas, around half a cup (120g) whole grain cous cous and around a cup (240ml) of boiling water or chicken or vegetable stock. 5. Simmer and stir. Cook for about 4 minutes until the water has been absorbed and the cous cous has fluffed up. Add more water if it is drying out too fast – different sizes pans will lose liquid at different speeds. 6. Once it is cooked take it off the heat and work on making the flavours sing. Until this point it may taste a bit flat so transform it with the zest of a lemon and the juice of half a lemon (add the juice gradually, tasting as you go). Or in place of lemon use a teaspoon (added gradually) of red or white wine vinegar. Add a tablespoon of soft goats cheese or regular cream cheese if you like it and have some in the fridge. Always add a good grating of Parmesan. Stir well. Taste and adjust the seasoning. You may need more acid or salt. Then serve immediately with a final grating of cheese. Find more recipes for cous cous, mushrooms and children’s meals here.